Whoa! Did they really do/say that?! You have no idea what just happened. All you know is that they hurt your feelings really badly with their words and/or actions. 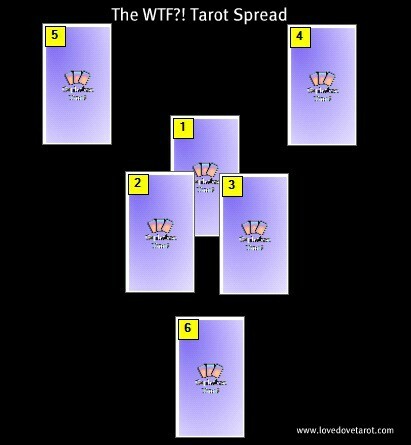 This Tarot spread will help you sort out what’s what and lets you know if the relationship is worth salvaging. Using the cards this way makes an excellent alternative to flying off the handle or damaging the relationship (and your own integrity) further by slagging your partner off to your best friend. Just excuse yourself, seek out solitude and pour yourself a cup or glass of something. It’s time to tune into your intuitive self for guidance from your Higher Self with the cards instead… And if you need to take a few deep breaths and count to ten first, by all means do so! 1. Shows you the underlying reason for what just happened. 2. Shows you how you really feel about this deep down. 3. Shows you how your partner really feels about this. 4. Shows you the worst approach to resolving this situation. 5. Shows you the best approach to healing the situation and addressing the root cause. 6. Shows you the likely outcome if you follow the advice given about the best approach.